Data driven testing allows you to repeat the same test many times, based on dynamic source data. Each row of evaluated data in a Data Driven test represents a separate scenario based around a testing structure, with different variables, and possibly different results. Data Driven Tests that are published to the SentryOne Test Web Portal display in this way, with each row from the evaluated data representing an individual testing component. In the SentryOne Test Web Portal users can inspect each individual scenario as a separate test online. Note: For information about creating a Data Driven Test in the Visual Studio Extension, see the Data Driven Testing Visual Studio Extension article. Data Driven Tests that are published to the SentryOne Test Web Portal display on the Data Testing Dashboard. Drill down into a selected test assembly, and select the test component with the page icon to open the Data Driven Test Cases page. The Data Driven Test Cases page displays detailed data about the most recent Data Driven test execution. Each line represents a row of data that was tested, and is considered to be an individual test in the assembly. Start The time when the individual row was tested during the execution. Parameter The parameters that are set within the test assembly display detail data about the contents of the tested row. These parameters are configured within the Visual Studio Extension. Status The result of the test. Duration The amount time taken to execute the test. Select a Start time to open the Execution details page for the selected test. Select the assertion on the Data Driven Test Execution Details (Test Case) page to open the Assertion Details page. 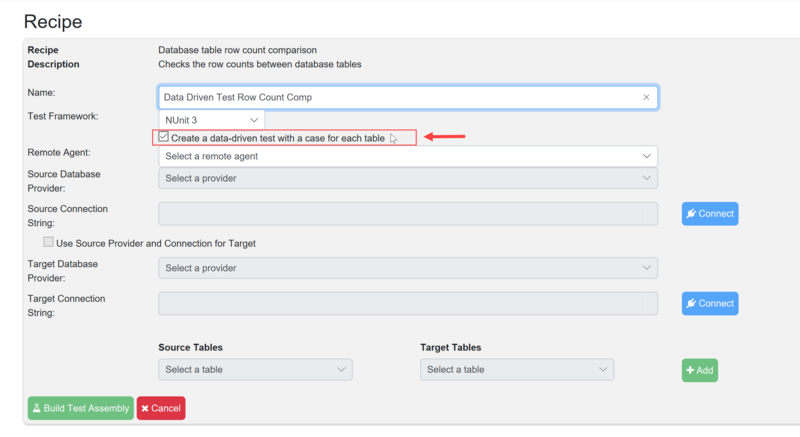 Example: Create a Data Driven test via the SentryOne Test Web Portal with the Database table row count comparison Recipe. Select Create a data-driven test with a case for each table to enable Data Driven Testing during the recipe configuration. For more information about the recipes in the SentryOne Test Web Portal, see the Recipes topic.